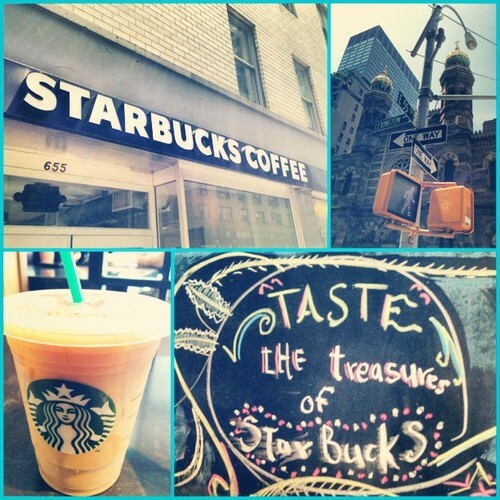 I wish I could say more positive things about the Starbucks on 57th & Lexington. My mother always said if you don’t have something nice to say don’t say anything at all. So I guess I will start with the positive. This Starbucks is in a great location. Lexington avenue in this odd mixture of Midtown and the Upper East Side is filled with retail possibilities, good restaurants, and public transportation. And that’s all the good I have. Honestly, this is just one of those Get In, Get Out locations. It’s triangular in shape and reminds me of my first NYC apartment that was nothing but this odd hybrid between a kitchen, living room and bedroom doors. There are only 7 stools up against one windowed wall. There’s no bathroom and nothing notable about the decor. Sometimes a Starbucks is just a Starbucks. 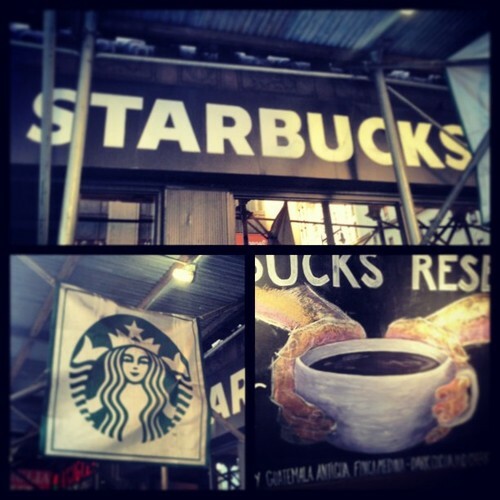 So far TriBeCa has been one of the most impressive neighborhoods I’ve visited — at least as far as Starbucks is concerned. Don’t get me wrong. The neighborhood is beautiful. I love the low buildings here that are contrasted by the towering skyscrapers of the nearby Financial District. And there seems to be an endless possibility of cafes, restaurants and trendy bars to jump in and out of. I’m making a note to come back here on a day when I have time to visit more than just Starbucks. 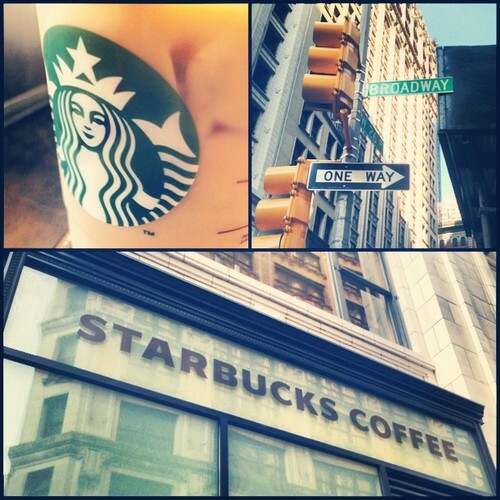 But, then again, the Starbucks is worth the visit. This location on Chambers and West Broadway is large, sunny and conveniently located over the red line. Luckily most of the business men and women are tucked away in their offices right now and the Starbucks is only lightly occupied. It’s most distinguishing feature is this small square seating room in the corner. It has faded mirrors on the walls, an old L-shaped bench occupying half of it, and large paneled windows that fill it with light. Although there’s currently construction outside on the street, it doesn’t affect the ambiance of this delightful Starbucks. Today summer is in full bloom here in NYC, and it’s the first day that I’ve felt the dreaded subway station sweats. So I figured: why fight it? I’m heading out to the Christopher Street Piers to soak in some sun. But on my way — of course — I just had to stop and get an iced coffee in the area. 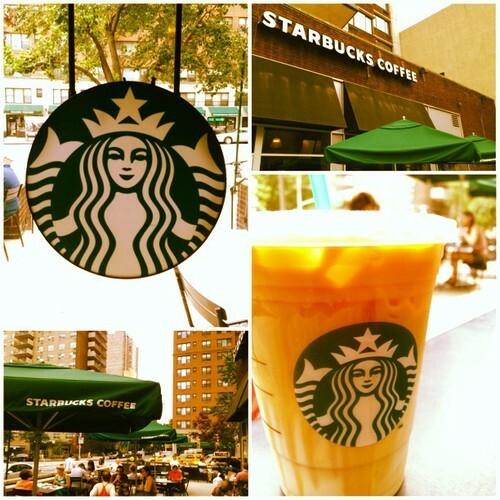 The Starbucks on Spring & Varick is located in a small neighborhood called Hudson Square. Apparently in the past it was known as the Printing District and it still contains a lot of media, communications, and advertising offices. Now they just don’t print as much as email. Hudson Square is west of SoHo, north of TriBeCa and south of the West Village. It’s basically the Southwest Village, only 7th avenue disappears into Varick street and the nice restaurants turn into tall business buildings. Although I’ve been to the Starbucks on Spring and Varick at least twice before, I noticed something for the first time today: there are only three chairs! This Starbucks is cute. Really cute. It’s on the street corner with large plate glass windows that let in lots of sun. All the tables and the bar are that nice beach wood style, and there’s plenty of open power outlets on the walls. But still… there’s only three chairs. The Starbucks on 55th and Lexington doesn’t seem like it stands a chance against the beautiful Saturday afternoon going on right now in the city. I see people jogging, biking, walking hand-in-hand out there in the sun… but in here it is nearly empty. A few people come and go but mostly they go. This is kind of refreshing since I’m usually fighting to squeeze myself into a seat at a crowded Midtown Starbucks but not today. There are lots of Starbucks in this neighborhood, which may also contribute to this location’s current vacancy. This one is a few blocks south of some great retail shops on Lexington, but here the area is mostly random restaurants and cheap shops. Inside there are two seating areas that form a small hall to the barista bar. There are outlets near most every seat and they are each spaced enough so that the place is not overly congested. The decor is simple and there’s just the one restroom in the back. Ultimately, the best thing this Starbucks has going for it is its lack of patrons. The Starbucks on 43rd and 8th avenue is one I noticed for the first time last night on my jaunt through Time Square on my way back home. I passed the New York Times headquarters (very impressive!) and then spotted it. 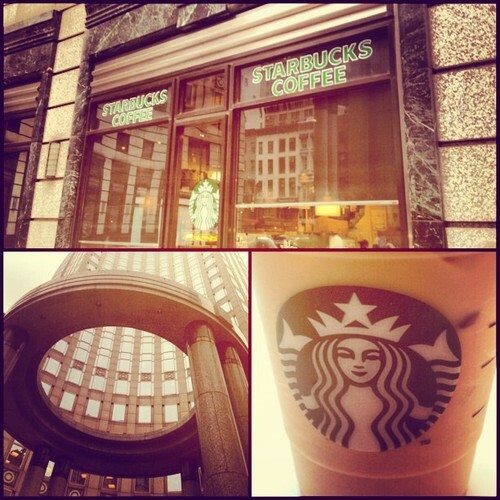 So this morning on my way to work I figured why not see what this Starbucks has to offer… unfortunately, it’s not much. The Starbucks was extremely crowded for 8am. Yes, I expect there to be a long line of New Yorkers seeking their morning fix. I expect people coming and going (and pushing) at rapid speeds. But this location — so close to Times Square and the Port Authority Bus Terminal — is filled with sight-seers and tourists filled with excitement and ready to start their day of NYC exploration. No available seats (not that this Starbucks had much to offer) and just one restroom, which I was actually surprised to see any at all. Oh, and did I mention the construction covering the exterior? The one good thing about this Starbucks: location, location, location… at least if you’re looking for the bright lights of the big city. Hurray for discovering a new neighborhood while simultaneously enhancing my NYC vocabulary! Welcome to NoMad — the neighborhood NOrth of MADison square park. Madison Square park divides NoMad and the Flatiron district and consists of a tiny patch of grass, a bunch of trees, some great picture ops and a Shake Shack. From what I can gather from strolling around NoMad, it’s a less congested (less Asian) version of Koreatown. I passed by a lot of perfume shops, jewelers, delis and sports apparel shops on my way to the Starbucks on the corner of 26th street and Broadway. All in all, I wasn’t expecting much from this Starbucks. However, when I entered I was forced to eat my words — well, my thoughts anyway. I don’t think I verbalized them. Not only is this a large Starbucks, but it is a large Starbucks with a balcony of additional seating. It probably has the most variety of seating I’ve seen in a while, ranging from high top stools to small tables and random elevated padded seating blocks. It’s very eclectic but effective. Unfortunately the upstairs was just closing up when I arrived, but that fact that it’s open for most of the day is only an added perk. Most seating has available outlets nearby so those burdened with dying laptop batteries need not fear. Also worth mentioning is the stylish decor throughout. Random coffee-related trinkets are shelved above the barista bar and espresso wood is everywhere you look. They’ve even got one of those coffee sack wall decorations hanging. All in all, I’m digging it. 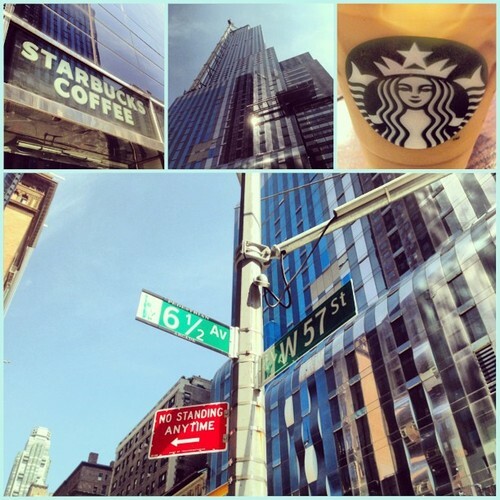 Who knew there was a 6 1/2 Avenue in Manhattan? Okay, okay… so it’s not actually an avenue — more so a crosswalk, but still spotting the street sign today was a pleasant surprise. It’s like the Platform Nine and Three-Quarters of NYC. And since this Starbucks is placed on the south side of the crosswalk, it must be a magical Starbucks indeed. If you’re looking at the image above and thinking something looks familiar — you’re probably right. The One57 building (which stands directly across from this 57th street Starbucks) is the same one that received national headlines when its construction crane snapped during Hurricane Sandy last year. I remember trying to cut through the area a few days after the storm only to be greeted with road barriers. That massive crane hung limp over 57th street for over 10 days at least. The building is still under construction and is slated to be Manhattan’s tallest condo skyscraper. As for the Starbucks across the street… it’s just so-so. Although there is not nearly the crowd I was expecting, it lacks the proper seating accommodations to adequately fill the space. There is a row of tables-for-two in the front and a community table across from the barista bar. It’s also larger than I suspected — not complaining — with only one bathroom and mostly covered up power outlets. 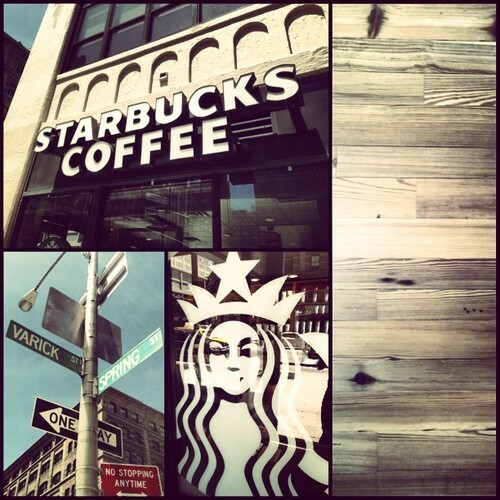 The Starbucks on 58th and 8th Avenue is full of unused potential. Well… maybe not potential, but certainly a lot of unused space. There is an entire back wall that is completely empty of tables and chairs. There’s even a lonely open outlet on the wall that probably never gets used — except for maybe the desperate person needing to charge their phone that wanders in once in a while. I can picture them leaning their on the wall, as I’ve seen at so many other Starbucks before. I think the lack of accommodations at this Starbucks is nothing more than a defensive strategy against the tourists and workforce that are assuredly beating down the door every hour of operations. 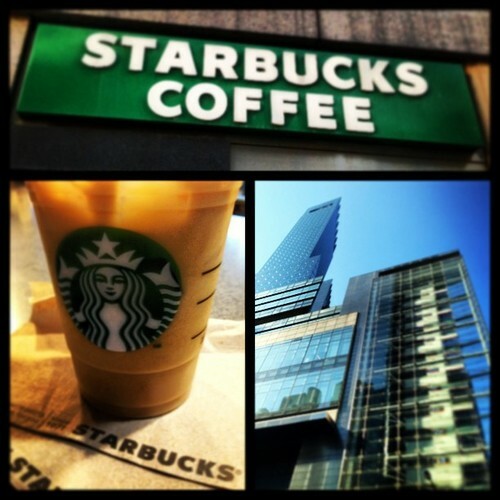 I remember visiting the Columbus Circle Starbucks just north of here and feeling like I was in a mosh-pit. Luckily I arrived here during a lull in business and was able to grab on of the few barstools that line the barista bar. The good thing about sitting in an uninviting Starbucks such as this one is that the crowd disappears fast. I see them come in the front order their drinks or see that the only restroom is currently out-of-order then head out. 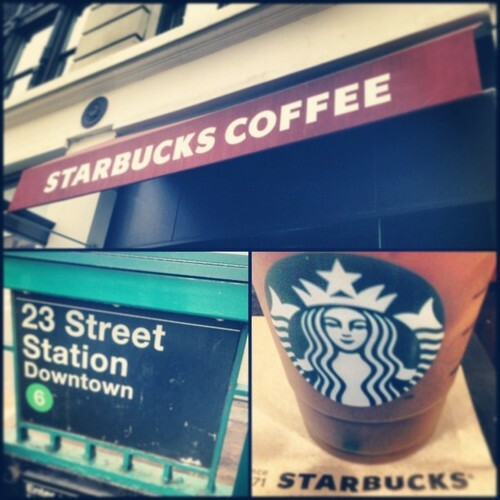 I first stumbled across the Starbucks on 85th and 1st Avenue last year in December. Once I saw it, I knew I would have to make a trip back up this way once the weather turned more agreeable. This is the only Starbucks in Manhattan (that I’ve seen so far) that has an outdoor seating area, equipped with dozens of tables and several patio umbrellas. The seating courtyard is raised up from the sidewalk and is equipped with WiFi. Sitting here typing on my laptop outdoors is bringing me Florida flashbacks of all my time spent at the Starbucks down south. In Florida, it was rare to find a Starbucks without an outdoor area — here it’s the exact opposite. Although I understand why. For almost half the year this location is practically unusable. The patio will be far too cold and the indoor seating is very limited. Still… it’s great to know there’s at least one on the island of Manhattan. 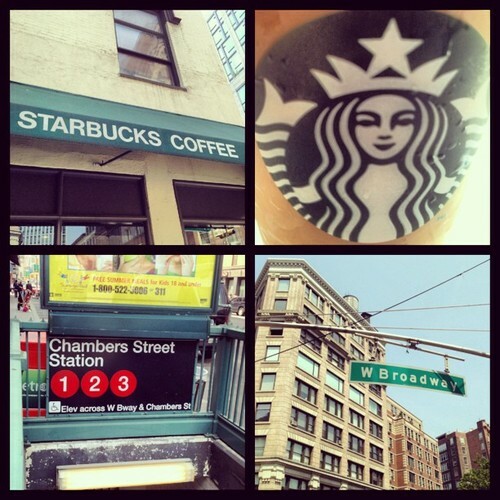 This Starbucks is located in a small neighborhood within the Upper East Side called Yorkville. It’s pushed off to the far east of the island and is just below East Harlem. Apparently it’s known for being affluent and family friendly. Lots of people pass with dogs, and it lacks the typical pushiness of NYC. All in all, this area is very quiet and peaceful. The only convenient trains are the 4/5/6, but maybe that’s the price you pay for peace of mind?